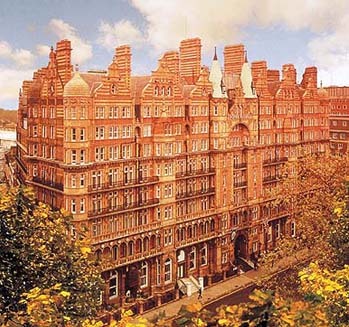 Location and Transport The Hotel Russell is situated in literary Bloomsbury, right in the heart of London on the border between the West-End and the City. Situated just minutes from the hustle and bustle of the West End, 'Theatre-land' and Oxford Street shopping yet in the immediate home place of The British Museum, British Library with "Peter Pan" and Charles Dickens House (across the Road). Underground: Russell Square Underground Station on the Piccadilly Line, direct to Heathrow Airport in 50 minutes, is 1 minute away. Holborn Underground on the Central Line, direct to the City, is 7 minutes walking distance. Train : Euston, King's Cross and St. Pancras mainline British Rail Stations are all within 5 minutes traveling distance. Waterloo British Rail Station and the Eurostar, Terminal are 10 minutes by taxi. Taxi : A taxi cab rank is situated directly opposite the Hotel, on Russell Square. Bus: Bus numbers 8, 19, 22b, 25, 38, 55, 98, 188, 91, 168 and 68 all stop at Holborn or Russell Square. A2 Airbus direct to Heathrow stops at Russell Square. Description Built at the end of the last century, the Hotel Russell is one of London's most impressive Victorian buildings with many outstanding architectural features. It was architect Fitzroy Doll's most remarkable work, inspired by the engravings of the Chateau de Madrid which once stood in the Bois de Boulogne. Hotel Russell has recently undergone a million pound refurbishment programme and boasts 357 en-suite bedrooms, including 160 air conditioned guest rooms, 15 Conference and Banqueting rooms, the well known Fitzroy Doll's bar/restaurant offering traditional cuisine, Virginia Woolf's restaurant which serves a lighter selection, and 2 bars. In addition the business person is well catered for with 'Boardrooms on the Square', which comprise a collection of meeting rooms for press receptions and interviews. There is also 'The Russell Business Centre', which includes 4 Motivator Conference Rooms and supporting business office. As we hold numerous events during the course of the year at this hotel we kindly ask you to contact us either by email or phone for the best rates. 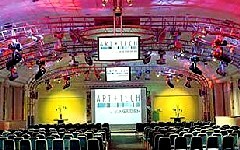 Our events are usually held in March, April, June, October and November. Our Comments The Hotel Russell is a grand 4 star deluxe hotel and has been a famous landmark in Bloomsbury for over a century. We are delighted to promote this hotel at special rates. This is amongst are most popular hotels and we warmly recommend this hotel.